HTS performs ABB/ALSTOM GT11N/N1,N2,11/13D and GT8 gas turbine, controls and electrical systems commissioning, maintenance, troubleshooting and upgrades, mechanical gas and steam turbine commissioning and maintenance, EV and standard combustor tuning and adjustments. 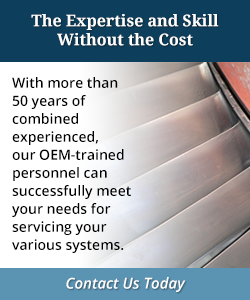 HTS engineers are OEM trained and certified with 20+ years experience. We also carry an extensive inventory of ABB P13, P14, Decontic, MOD300 and ABB LCI (SFC) parts.